An afternoon visit to the Hope Zoo on August 20, 2011 was a good time as we were able to catch up with curator Orlando Robinson and a zookeeper after they made a Cuban Boa's enclosure more comfy. A few moments with Orlando gave us some insights on the news residents and what we can expect will be happening at the zoo in the very near future. The Guardsman Group and Hope Zoo Preservation declare proudly that they are working to make our zoo the finest in the region. Certainly, they probably have the finest beauty spot for a zoo in the region as their ongoing inspiration. There was also a sign installation team erecting boards that promote the ongoing refurbishing, and that give visitors early guidelines on what is expected of them. On this visit, the call of macaws announces that the Cuban iguanas have been relocated and their enclosures are now occupied by one dozen red and blue macaws and another yellow and blue macaws. The other birds in residence of course include cockatiels, lovebirds, the Jamaican yellow billed parrot, an ostrich pair, birds of prey among others species. 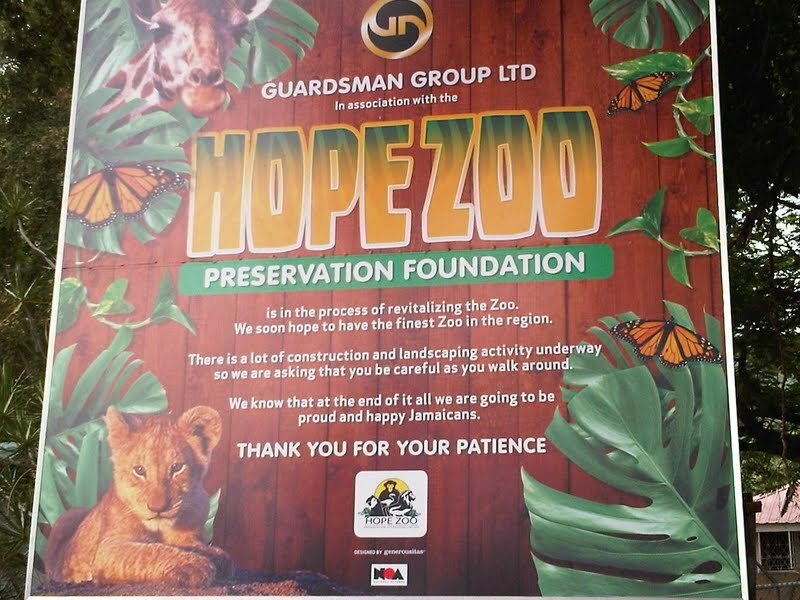 We look forward to see the coming flamingo attraction and see if it will be compared with the famous Ardastra Gardens flamingos on New Providence Is, The Bahamas. Visiting Hope is now even more relaxing as several picnic style benches and tables have been installed on the outskirts of lawns, where children naturally run freely. What we wanted to know from Orlando first was why the area outside the snake house had been squared off with pegs and cord. He said that the house was going to be expanded and have more and larger snakes, even an anaconda. The one-eyed juvenile American crocodile that was housed there has become too large and been moved out but not on exhibit. His home is now occupied by smaller residents. Of the big enclosures being constructed, he said that one will house spider monkeys. 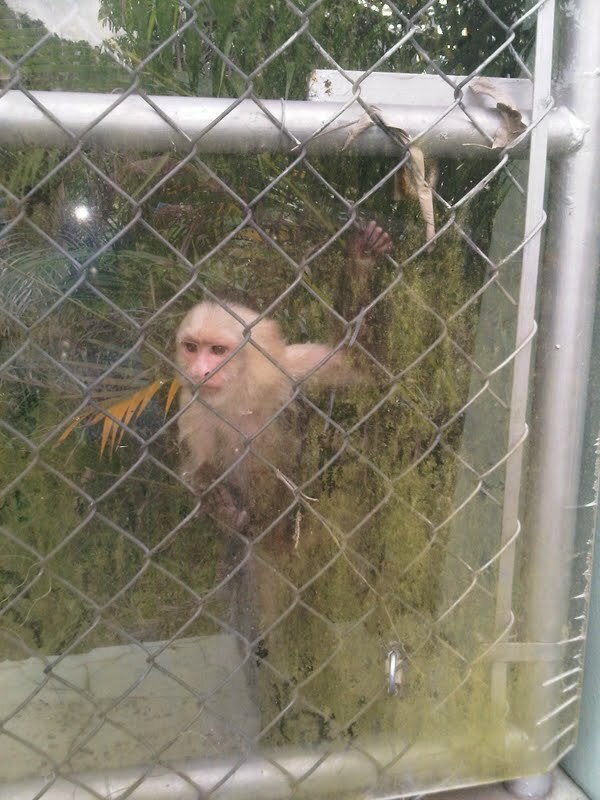 There is one new monkey in the zoo, the playful Sampson who was confiscated because it was brought into the island illegally. He is very active inside of a large enclosure. You can see him through the hard plastic window. The two big cat enclosures are being joined to create a larger lion enclosure. Visitors will be able to see the lions from behind glass. This will hopefully put less stress on the animals. Orlando confirmed that the ostrich pair have finished moulting, and the new feathers have started to appear. The pegged out areas in front of the snake house, the manager says, is where the new enclosures will be put to expand that reptilian area, and a boa constrictor will be one of the residents. All but one of the apartments in the birds of prey section is occupied, only the American Kestrel (Killy Killy) is left to join the owls, hawk and eagle, Orlando said. 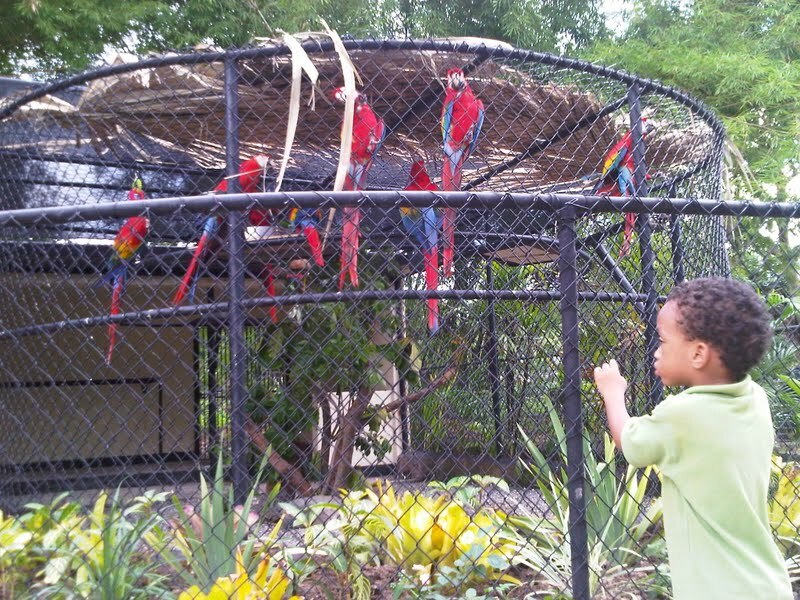 The Hope Zoo is a breeding station of the Jamaican Iguana which was thought to be extinct for decades. It is good to see that the sign on the breeding site is now clearly visible saying that it was developed with the assistance of several zoos in the United States of America. Long may that association continue. The zoo may, at some time in the future, wish to remember the work of Dr Peter Vogel in allowing this endemic creature a sustainable comeback. 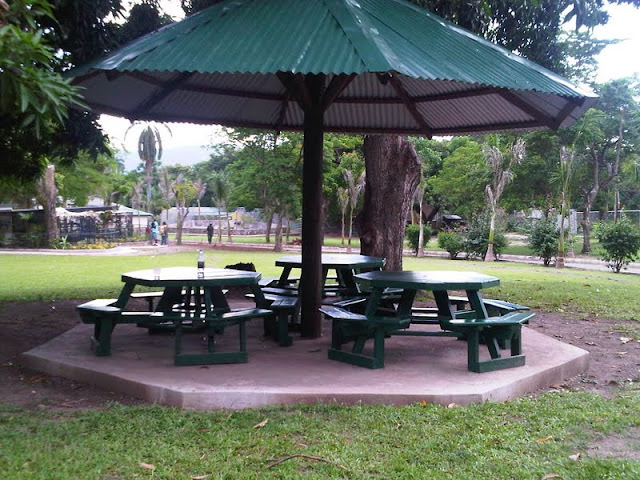 One of several picnic areas at the Hope Zoo where adults can watch while children have a supervised look around. The zoo put Sampson down as he was tested positive for a disease.